SABIC is a Saudi diversified manufacturing company, active in petrochemicals, chemicals, industrial polymers, fertilizers, and metals. It is the largest public company in the Middle East and Saudi Arabia as listed in Tadawul. 70% of SABIC's shares are owned by Saudi Aramco. Private shareholders are from Saudi Arabia and other countries of the six-nation Gulf Cooperation Council (GCC). SABIC was the world's fourth-largest chemical producer in 2013. It is currently the second-largest global ethylene glycol producer and is expected to top the list after the introduction of new projects. SABIC is the third-largest polyethylene manufacturer, the fourth-largest polyolefins manufacturer, and the fourth-largest polypropylene manufacturer. SABIC is also the world's largest producer of methyl tert-butyl ether, granular urea, polycarbonate, polyphenylene and polyether imide. In 2014, SABIC was ranked fourth in the world among chemical companies by Fortune Global 500, and the world's 205th-largest corporation. In 2010, SABIC grew to be the second-largest diversified chemical company, or first when measured only by asset value. Measured over all its branches, it became (as of 2014) the world's 98th-largest corporation on the Forbes Global 2000 ranking (which lists only publicly traded companies), with sales revenues of $50.4 billion, profits of $6.7 billion and assets standing at $90.4 billion. The company is based in Riyadh and has interests in 17 affiliated companies, which range from full ownership to significant partial participation. SABIC was founded in 1976 by royal decree to convert oil by-products into useful chemicals, polymers, and fertilizers. The first chairman of the company was Ghazi Abdul Rahman Al Gosaibi, the Minister of Industry and Electricity, and the first CEO was Abdul Aziz Bin Abdullah Al Zamil. SABIC's founding transformed the small fishing villages of Jubail on the Persian Gulf and Yanbu on the Red Sea into modern industrial cities. Production in 1985 was 6.5 million tons; five years later production rose to 13 million tons and by 2003 production had risen to 42 million metric tons and by 2012 to over 60 million tons. SABIC employs more than 40,000 people globally and has 60 manufacturing and compounding plants in over 40 countries. SABIC's manufacturing network in Saudi Arabia consists of 18 affiliates. Most of these are based in the Al-Jubail Industrial City on the coast of the Persian Gulf. Two are located in Yanbu Industrial City on the Red Sea and one is in the eastern city of Dammam. SABIC is also partners in three regional ventures based in Bahrain. SABIC is a market leader in key products such as ethylene, ethylene glycol, methanol, MTBE and polyethylene. SABIC's wholly owned subsidiary, the Saudi Iron and Steel Company (Hadeed), based in Al Jubail, is one of the world's biggest fully integrated producers. SABIC underwent a business restructuring in October 2015, that saw the absorption of the commodity chemicals produced under the Innovative Plastics SBU into the Chemicals and Polymers SBUs. Along with this, the Specialties SBU was created to house the remainder of the Innovative Plastics products that did not fall under the commodity umbrella and the Innovative Plastics SBU would cease to exist by January 1, 2016. This change follows the reallocation of the Performance Chemicals portfolio into the Chemicals SBU. The business units are currently: Chemicals, Polymers, Fertilizers (Sabic has three fertiliser affiliates: Safco, Samad and Ibn Al-Baytar ), Metals and Specialties, plus manufacturing. Along with this change it was announced that the Innovative Plastics headquarters in Pittsfield, United States, would be closed, and the SABIC Regional Headquarters for the Americas would be relocated to Houston. In July 2002, SABIC commenced operations in Europe after the $1.98 billion acquisition of the petrochemicals business of Dutch group DSM. SABIC Europe, SABIC's European subsidiary, produces over 2 million metric tonnes of polymers and over 5 million metric tonnes of basic chemicals. It employs over 3,000 people and has two major manufacturing locations in Geleen in the Netherlands and Gelsenkirchen in Germany. 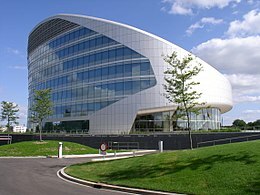 After forming SABIC Europe, SABIC became the 11th-largest petrochemicals company in the world. The purchase of DSM signified SABIC's intent to expand and become a true global company. In 2004, the value of SABIC shares, listed on the Saudi Stock Exchange (Tadawul), increased 170% while its net profits increased by 112% from 2003 to 2004. In 2005, SABIC was the Middle East's largest (in terms of market capitalization) and most profitable publicly listed non-oil company, the world's 11th-largest petrochemical company, ranked 331 on the Fortune Global 500 for 2005, the second-largest producer of ethylene glycol and methanol in the world, the third-largest producer of polyethylene and overall the fourth-largest producer of polypropylene and polyolefin. Standard & Poor's and Fitch Ratings claimed SABIC to be the world's largest producer of polymers and the Persian Gulf region's largest steel producer for 2005; they assigned SABIC an "A" corporate credit rating. That same year, Bloomberg ranked SABIC as the 13th-largest company in the world in terms of market capitalization (at the beginning of 2005 it exceeded ر.س 375 billion, the equivalent of US$100 billion) and the second-largest by market value outside the US and UK. In June 2006, SABIC established the "SABIC Sukuk Company" to issue Islamic bonds (Sukuk) that are estimated to range between ر.س 1 billion (US$266.67 million) and ر.س 3 billion (US$800 million). In January 2007, SABIC Europe took over Huntsman Corporation plants in the UK. Headquartered in Sittard, Netherlands, SABIC Europe has a European wide network of sales offices and logistic hubs, as well as three petrochemical production sites in Europe: Geleen (Netherlands), Teesside (United Kingdom), and Gelsenkirchen (Germany). In 2008, SABIC Europe produced 7.3 million metric tons of petrochemicals, mainly for the European market. On May 21, 2007, SABIC acquired General Electric's Plastics division, in a US$11.6 billion cash deal, including US$8.7 billion of its liabilities, and launched SABIC Innovative Plastics. In that year, the company ranked 145 (previous rank: 301) in the Forbes Global 2000 list. As of 2014, SABIC Innovative Plastics is a multibillion-dollar company with operations in more than 25 countries and over 9,500 employees worldwide. In July 2009, SABIC received approval from the Chinese government to build a US$3 billion petrochemical complex in China, in order to gain a foothold in the world's fastest-growing chemicals market. In January 2018, SABIC announced that it had acquired a 24.99% stake in Clariant, the Swiss specialty chemical manufacturer. The stake was acquired from activist investor White Tale, and at Clariant's prevailing market-capitalisation would have been valued in the region of $2.4bn. The actual transaction price was undisclosed. SABIC CEO Yousef Al-Benyan had previously stated, in November 2017, that the company was looking to spend $3bn-$10bn on acquisitions over the next 10 years. On March 27, 2019, SABIC announced that state-owned energy company Saudi Aramco signed a share purchase agreement to acquire a 70% majority stake in SABIC from the Public Investment Fund of Saudi Arabia in a private transaction worth $69.1 billion. Expansion operations and investments are projected to amount to US$20 billion in 2007 and US$70 billion until 2020. The overall total production in 1985 was 6.3 million metric tons; by the end of 2008 it had reached 56 million metric tons. By 2020, SABIC intends to produce over 135 million metric tons per year. SABIC reported preliminary consolidated financial results for the period ended September 30, 2010. Net income for the third quarter of 2010 was ر.س 5.33 billion, compared to net income of ر.س 3.65 billion in the same period the previous year, representing an increase of 46 percent and compared to ر.س 5.02 billion for the previous quarter, a rise of 6 percent. ^ "SAUDI BASIC INDUSTRIES CORP (SABIC:Saudi Arabia): Stock Quote & Company Profile - Businessweek". investing.businessweek.com. Retrieved 11 May 2018. ^ a b Hertog, Steffen (2008). "Petromin: the slow death of statist oil development in Saudi Arabia" (PDF). Business history. 50 (5): 645–667. doi:10.1080/00076790802246087. Retrieved 16 September 2013. ^ "SABIC announces global operational transformation to better meet customer needs | News | News & Media | SABIC". www.sabic.com. Retrieved 2015-10-08. ^ "Sabic dissolving Innovative Plastics unit, leaving Pittsfield, Mass., HQ | Plastics News". www.plasticsnews.com. Retrieved 2015-10-08. ^ Karam, Souhail (2011). "Saudi SABIC says China govt approved Sinopec JV | Reuters". uk.reuters.com. Retrieved 19 August 2011. ^ "Saudi Aramco Agrees to Buy 70% Stake in SABIC from Kingdom's Public Investment Fund | SUSTG.com – News, Analysis, and Features on all things Saudi Arabia". Retrieved 2019-03-28. Wikimedia Commons has media related to SABIC.